Returnable bumper storage racks are essential for safely mounting and transporting bumpers from Tier One automotive suppliers to vehicle manufacturing and assembly factories. EGA Products utilizes a long history of precise engineering and manufacturing expertise to customize a returnable bumper storage rack to meet your exact needs. If you already have a project in mind, call EGA Products at 262-781-7899 or Request A Quote today! This company needed a solution to help transfer various completed bumpers from the Tier One supplier to the sequencing center at the automaker’s assembly facility. They requested a custom returnable bumper rack design that would protect the bumper’s finish, keep it secure during transport, eliminate the need for wasteful packaging, and refrain for taking up too much space on the factory floor or the trailer bed. EGA Products responded with a low-profile bumper storage rack that used polyurethane dunnage bars, vinyl pads, fold-down support pins, and securing swing trays to cradle the front bumpers so they could be shipped densely, without marring the bumpers’ delicate finish. This eliminated the need for bubble wrap, tie downs, and other conventional dunnage that adds to production time and requires time-consuming recycling and disposal processes. Fold-down support pins served as additional locators, and the bumper shipping racks were precision-manufactured to hairline tolerances, in order to interface with the automaker’s advanced robotic systems. The end result was a custom-fabricated returnable bumper storage rack that allowed the German auto manufacturer, and their Tier One supplier, to save time and money throughout the production and transportation processes. EGA Products can do the same for your automotive or Tier One supply company. Give us a call at 262-781-7899 or Contact Us now to learn more. Rely on EGA Products’ experienced, innovative engineers to design and build a custom bumper stacking rack to help your production line keep up with demand. We offer a litany of custom fabrication services in the materials handling space, and enjoy taking on challenges big or small. Our heavy duty bumper storage racks are crafted from stainless steel, built to last through rigorous use and constant travel. They can be finished with painted enamel, a powder coat, hot-dipped galvanized steel, or any other custom finish that fits your company’s branding strategy. 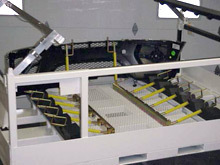 EGA Products returnable bumper racks also include fork pockets, label holders, skid runners, and precisely placed, sequentially numbered stenciling to accommodate production flow and other unique requirements. EGA Products is a leading innovator in the materials handling and custom fabrication industries, and strives to do everything we can to meet and exceed customer expectations. Read our customer testimonials, or give us a call today to learn how we can help your business grow. Learn more about our other Custom Designed & Manufactured Products. I have been associated with EGA for almost twenty years. Beyond the exceptional quality of their products, the staff at EGA is focused on the highest levels of customer service and satisfaction. Any issues that have occurred have always been resolved quickly. In the thirty years that I have been in business I have worked with countless manufacturers. EGA is the standard with whom I measure these other manufacturers.